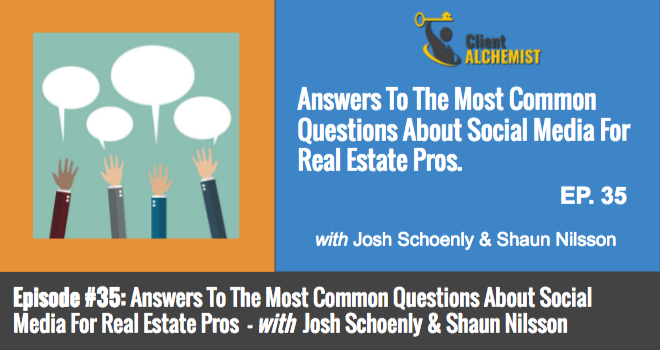 Listen in to the last of this 4 part series with Shaun Nilsson (co-founder of CityBlast.com) as we provide answers to the most common questions about social media for real estate pros. To listen to part 3 of the series CLICK HERE. To listen to part 2 of the series CLICK HERE. 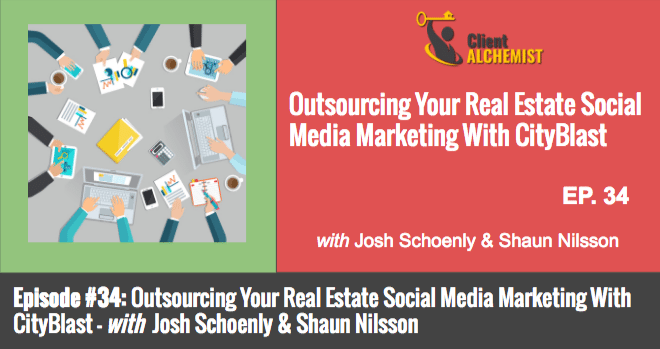 In part 3 of this 4 part series with Shaun Nilsson (Co-Founder of CityBlast.com) you’ll learn how you can outsource your social media marketing, so you can focus on what you do best! 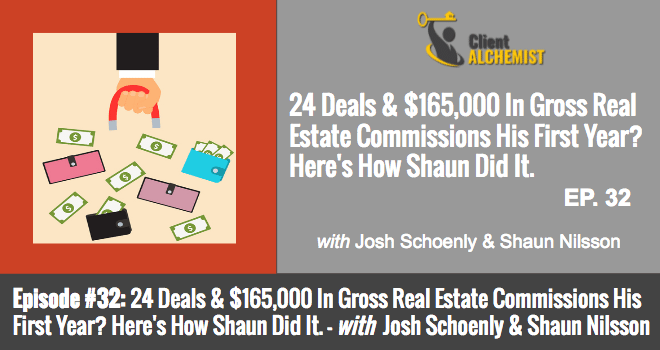 24 Deals & $165,000 In Gross Real Estate Commissions His First Year? 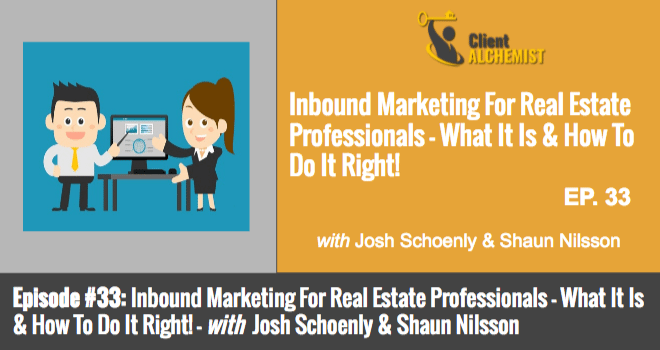 Listen In To See How Shaun Did It Using ONLY Inbound Marketing Strategies. 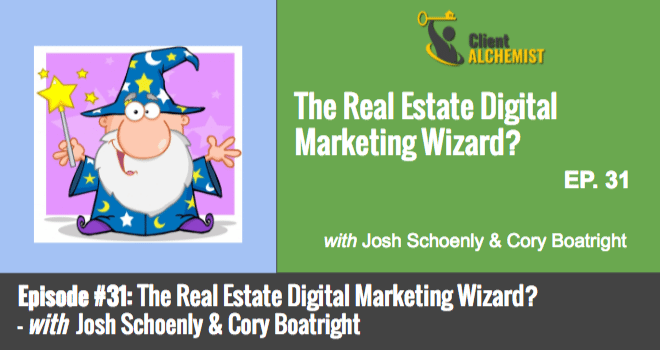 Episode 31: The Real Estate Digital Marketing Wizard? - Who's influenced him the most. - Plus a whole bunch more. Episode 30: The #1 FASTEST Way To Get *MOTIVATED* Buyers & Sellers Calling Or Texting You RIGHT NOW! 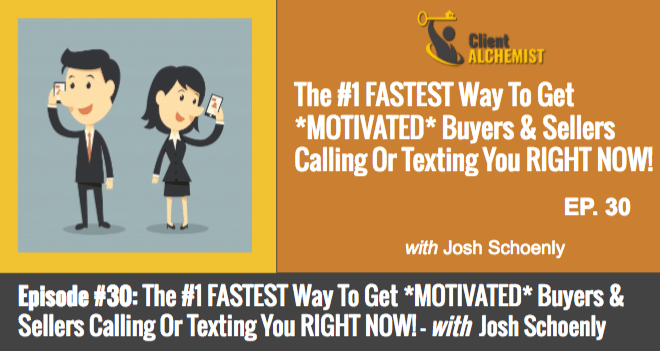 The #1 FASTEST Way To Get *MOTIVATED* Buyers & Sellers Calling Or Texting You RIGHT NOW! So listen in, take notes & TAKE ACTION. Episode #24 - Build Your Buyers List QUICKLY (& Consistently) With This 6 Step Process - CLICK HERE TO LISTEN. Episode #13 - How Justin Closed 220 Deals In 2015 Using "The Client Alchemist Way" & 5 Takeaways You Can Implement Immediately - CLICK HERE TO LISTEN. 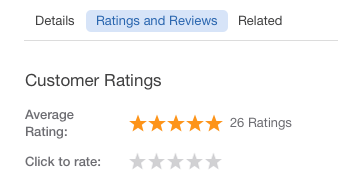 Episode #21 - A 3 Step Framework For ATTRACTING "Come List Me" Sellers - CLICK HERE TO LISTEN. 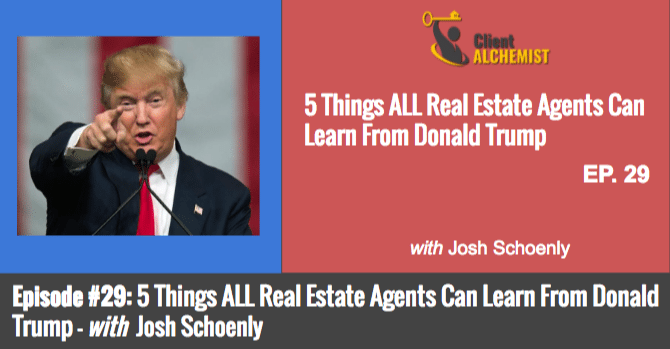 In episode #29 you'll discover 5 things ALL real estate agents can learn from Donald Trump. 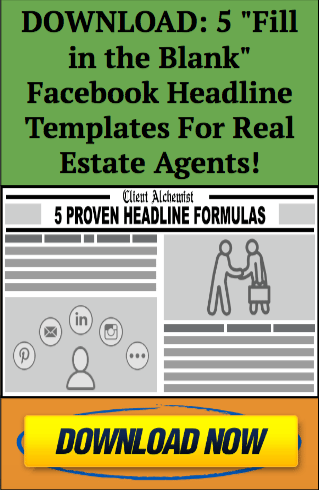 In episode #28 you'll discover the "perfect" 6 step Facebook post template for attracting MORE clients today. To get the PDF & video walk through promised on today's episode just CLICK HERE. 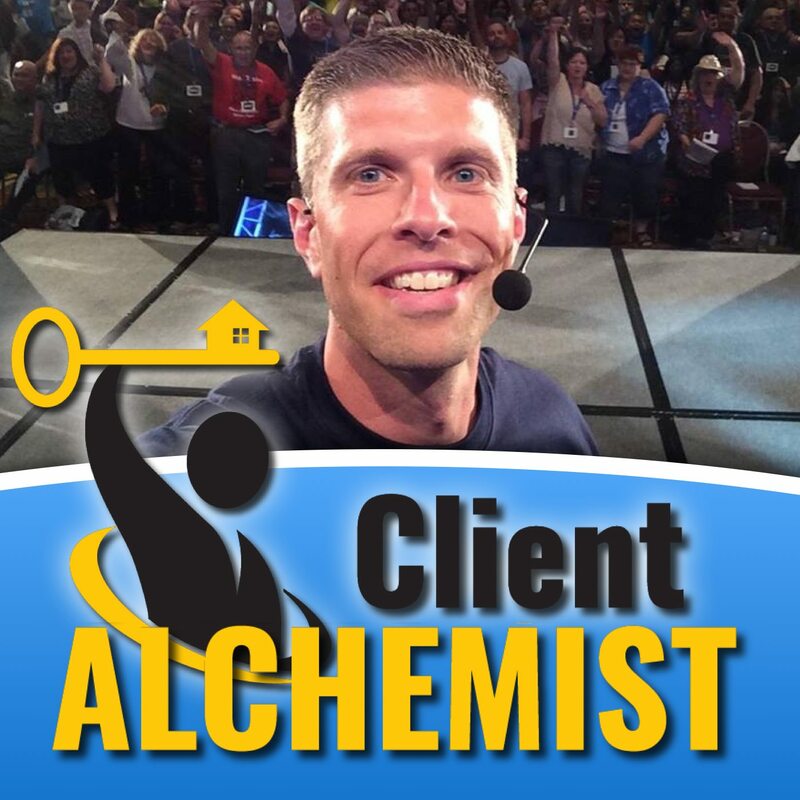 Episode #5 - “The Client Alchemist Way” - Step #4:­ Turning CONVERSATIONS Into Clients! In episode #27 of "The Client Alchemist Show" a story about my "weed-eater" & how it can help you in your real estate business (and life). But in this episode you'll see how it applies to your real estate business. Episode 23: The #1 Asset In Your Real Estate Business? ...and 5 reasons why you should be consistently building this asset EVERY single day. #13 - How Justin Closed 220 Deals In 2015 - CLICK HERE to listen. #22 - How Our PRO Members Get EXPONENTIALLY More Clients - 5 Lessons You Can Start Applying TODAY - CLICK HERE to listen. In episode #22 of "The Client Alchemist Show" we're digging into the top 5 reasons why our PRO members consistently get EXPONENTIALLY more clients than the "industry averages". And most importantly 5 lessons you can start applying TODAY.